Preparing a good meal is always better than eating junk food or snacking, but you’ll always end up with dirty dishes. Unfortunately, if you live in a rental apartment that means your house cannot accommodate a built-in dishwasher. And in this busy economy, many people either don’t have the time to do the dishes or just don’t like spending their time hand washing. A countertop dishwasher may just be what you need, the next big thing that beats hand washing dishes. 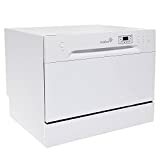 If you’re looking for cheap dishwashers for your small rental apartment, then you need to check out our portable dishwasher reviews for the best recommended models available in the market. The SD-2224DS is small enough to fit office kitchens or your small apartment. It has a 17.24-inch height and even with its compact design, this dishwasher will offer you full-size power and excellent service. 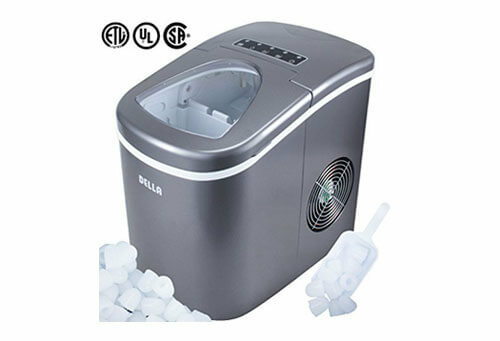 Its spacious cavity can accommodate six standard place settings and has seven wash cycles including Heavy, light, normal, rinse speed, soak, and mini party. Moreover, the universal faucet adapter allows for easy installation, and quick connects to any kitchen thus no need for direct plumbing. The electronic controls have a LED display that will alert you of the current running state. You’ll surely like the warning indicators that will tell you when the tap is not on or when the rinse aid needs refilling. These features along with its energy consumption, noise level, and item weight will make the SPT SD-2224DS ideal for your apartment. 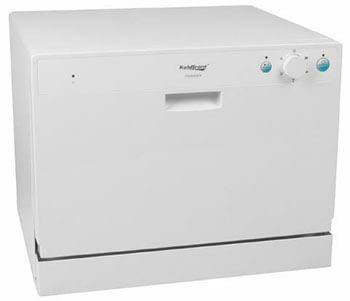 Koldfront’s portable dishwasher ranks among the most high-tech dishwashers available in the market. 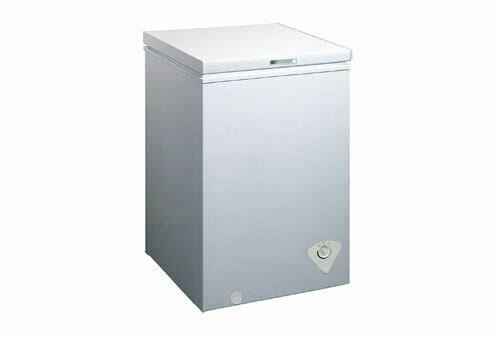 Its variety of features makes it versatile and highly efficient. 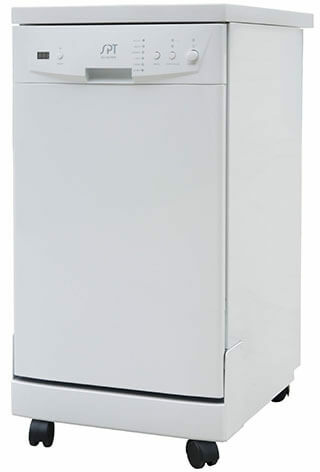 Among other advantages of the PDW60EB, this dishwasher is very light in weight making it easy to move from place to place. 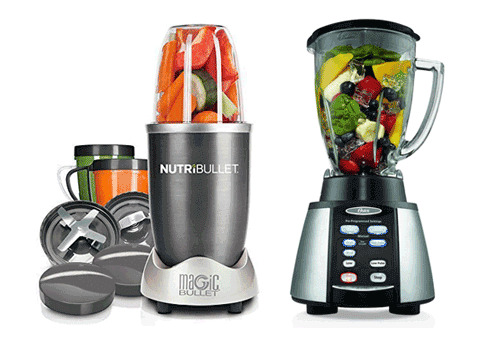 Moreover, it’s easy to setup and is perfect for people concerned about eco-friendliness. The Koldfront PDW60EB stands over 17 inches high and has a low-profile that will fit comfortably under most cabinetry. It uses 61% less energy as opposed to other dishwashers and uses little water. This dishwasher has six wash cycles and holds six place settings. Further, it comes with a cup shelf, a dish rack and cutlery basket for easy organization. The stainless steel interior and its heavy wash cycle will give your dishes a spotlessly clean wash. You’ll undoubtedly love this countertop dishwasher. 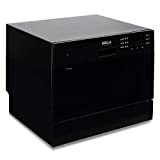 The SD-2202W stands out among other similar cheap dishwashers because you can program it to start with an 8-hour delay if you wish. 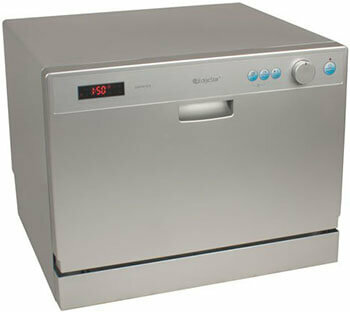 Just as other dishwashers for sale in this list, it has six wash cycles and a six standard place setting capacity. This machine is compact and quite light in weight making it easy to move around whenever you want to reposition it. 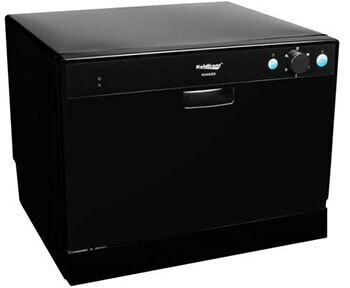 This 17.24-inch unit additionally has user-friendly controls and includes a silverware basket and dish rack. It will hold plates with a diameter of up to 10.5 inches. Faucet adapter included allows for quick and easy installation you won’t have to worry about direct plumbing. This compact dishwasher is ideal for any small size kitchen and will perfectly fit between most countertops. 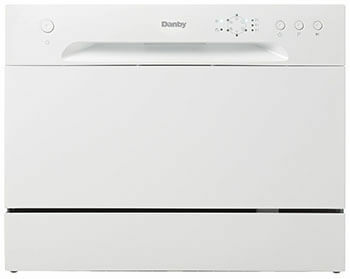 Danby’s countertop dishwasher DDW621WDB is perfect for anyone looking to save money on water since it only consumes up to 3.1 gallons of water for every wash. This energy star compliant unit has six wash cycles that range from normal, economy, intensive, glass, soak and rapid. Moreover, it has a six place setting capacity and includes a silverware basket for perfect organization. You’ll love its compact design that will fit your small-sized kitchen while its quick connect feature makes it pretty easy to install and is compatible with most kitchen faucets. The durable stainless steel interior and stylish white exterior truly make it stand out from most dishwashers. If your counter space is quite limited, there’s always an option of an affordable roll-away dishwasher you can always put out of the way immediately after use. 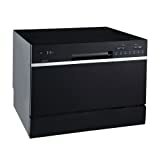 This 18-inch dishwasher from SPT truly shrinks the function and form of any built-in dishwasher while improving its effectiveness to any kitchen where permanent installation can’t be an option. Equipped with a time-delay feature, this white unit allows you the freedom to program its operation at a later time between one to twenty-four hours should you want to. It has a spacious cavity with eight standard place settings and an adjustable upper rack that will help accommodate larger plates or pots. 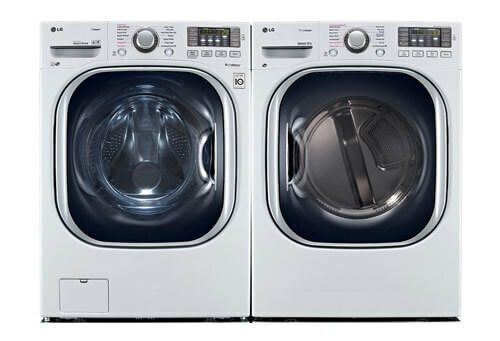 The all-in-1 six wash programs, error alarm, warning indicator, low energy and water consumption are additional features that make this unit beat the competition. 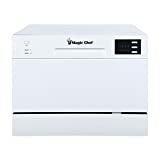 Aside from its chic design and stainless steel interior, Magic Chef’s countertop portable dishwasher features a six place setting capacity and includes a cup rack and cutlery basket. Its electronic controls are easy to use while the quick setup kit allows for convenient self-installation. 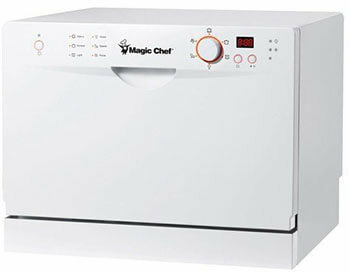 The Magic Chef MCSCD6W3 has five wash cycle options with an organized interior arrangement. Its drying system and the anti-flood device gives this portable countertop dishwasher a unique touch making it different from other models. Aside from the fact that this unit reduces your energy bills, it equally uses little water helping you save money on water consumption. It is pretty easy to install and operate and has six wash cycles. It is optimized to hold up to six place settings and further comes with a cup shelf and cutlery basket for easy organization. The internal water heater and its heavy wash cycle help eliminate germs while the rinse agent dispenser will minimize water spotting on your dishes. Its compact countertop design lets it sit comfortably under your cabinetry without any permanent installation required. Edgestar’s countertop dishwasher stands at 17 inches and features digital controls with LED display that are very easy to operate. Moreover, it includes a child lock function and delay feature that allows you to program its operation when you want. Its powerful spray arm will thoroughly wash your dishes while the internal water heater boosts the waters temperature to 149 degrees Fahrenheit, the perfect temperature for eliminating germs. It holds up to six place settings and uses less energy than other models. The five-foot hose makes hook up to any faucet quite simple. 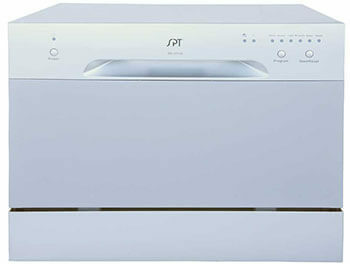 Designed to accommodate up to six standard place settings, this dishwasher unit from SPT has six wash cycles and features simple electronic controls with indicator lights. 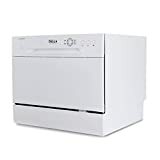 It ranks among cheap dishwashers and features both water and rinse-aid warning indicators that help prevent any unexpected situations that may occur. The universal faucet adapter allows for easy connection to almost any kitchen faucet. This 17.24-inch unit additionally has a delay start feature for added convenience. 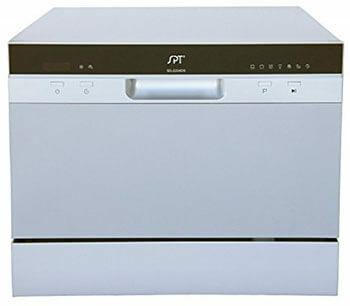 Equipped with an 8-hour delay function, SPT’s white portable countertop dishwasher lets you program operation at any time you feel like washing the dishes. It has a stainless steel interior and a generous capacity of six standard place settings aside from six wash cycles. The faucet adapter allows for quick and straightforward connection in almost any kitchen faucet thus no need for permanent installation. You’ll love it’s lightweight and durable design that makes it easy to move whenever you want to reposition it. 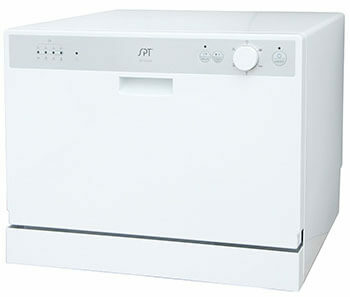 With a noise level of 55dB, this 17.24-inch compact unit is quieter than most cheap dishwashers for sale. You’ll equally be able to save some cash on energy and water bills with this countertop dishwasher. 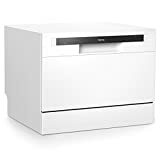 While there are many other great models available in the market, this list of portable dishwasher reviews will be great investments and worth considering when shopping for cheap dishwashers. Before setting out to check dishwashers for sale, you’ll want to consider the space you have in your apartment to find one that fits. Moreover, you want a unit that will save your energy and water bills aside from offering multiple cycles and flexible loading options.